We’d love your help. Let us know what’s wrong with this preview of The Truth about Burnout by Christina Maslach. To ask other readers questions about The Truth about Burnout, please sign up. An indictment of American corporate management and yes, we've all been there. In some ways the vaildation here is comforting but in most ways, it is not, largely because the solutions posed - and yes there are apparently solutions - are just not practical in some work settings. The author presupposes that there is unity among the ranks and that all workers have the courage to not roll over and accept the miserable status quo. Sadly that is not the case. This book is 20 years old and still is pretty relevant since most of the problems with companies that grow are people-related rather than whatever unique challenges of the business sector they are in. It was very dry and kinda hard to push through though. Helpful for establishing the problem of burnout in our current market and indicating some approaches for change. Great starting point for organizations battling staff disengagement and burnout. Material is surprisingly current given how old it is. 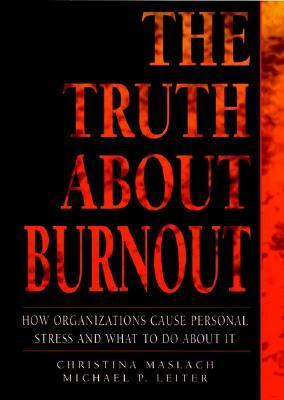 This is an interesting book that, well, tells the truth about burnout. For those of you who don't know, "burnout" is basically what happens to workers who lose passion for their work and accordingly both they and their work suffer for it. Maslach and Leiter do a good job to explain burnout in simple terms with some helpful examples. They also separate burnout from clinical issues, such as depression, and personality issues. Over and over again they emphasize the crucial role of a good fit betwee This is an interesting book that, well, tells the truth about burnout. For those of you who don't know, "burnout" is basically what happens to workers who lose passion for their work and accordingly both they and their work suffer for it. Maslach and Leiter do a good job to explain burnout in simple terms with some helpful examples. They also separate burnout from clinical issues, such as depression, and personality issues. Over and over again they emphasize the crucial role of a good fit between worker and job, and moreso the organization forces that affect it (that is, such issues the worker experiences cannot rightly be blamed on the worker). They highlight six major causes of burnout: work overload, lack of control, insufficient reward, breakdown in community absence of fairness, and conflicting values. The authors take a balanced tone throughout the book. They don't attack management as evil-doers trying to wring every drop of joy and effort out of helpless clock-punchers. Instead they do a thorough job explaining the common misconceptions about burnout and why "It's a problem of the individual [worker:]," is both wrong and counter-productive. Furthermore, they explain the many effects that burnout has through departments and entire organizations. Basically, when people become disengaged from their jobs, quality decreases, people job contributing any more than they must, suspicion and hostility increases, medical and mental health expenses increase, sick days increase, cynicism sets it, and monetary reward more and more becomes the main reason to work. The authors provide several examples to illustrate cases. I liked information in the appendix about the burnout measure that Maslach developed, but I would have like more detail and explanation (at it seems central to the whole book). Déjà vu. At first this book was really interesting, but after the first, say, 30 pages I got the feeling they were repeating themselves. By the end it felt like I was force-feeding myself the same leftovers I'd been eating for the past week. Do they explain what burnout is, show why it matters, and illustrate how it all ties together in clear examples? Yes. But they took 169 pages to do a job that could have taken about 30. By the end it just felt like the same stale mush you find in any standard school giant text book. No flavor, no spice, no urge to turn the page except to make sure you didn't miss anything. This book could have used more focus. They should cut down all the tedious redundant passages, I think put in there for emphasis. It only takes one paragraph and one clear cut example to make the case for a good fit between worker and role, or for fairness in the workplace, of for conflicting office values, or for work overload, etc. Furthermore, the examples they use do make the point, but they are so stale and watered down with soft language that it takes the bite out of the experience. For example, on page 54 they use the example of Jane the researcher at a university who gets screwed out of her guaranteed research space for her lab; she later finds out that her space was cut to entice a new professor to the program, and furthermore that, contrary to assurances by the dean, among the researchers she was the only one to have a space reduction. The dean approved this because "he had assumed that Jane, being such a nice person, would not be as upset as some of the other professors might have been about losing lab space. Quite the contrary, Jane was furious about the unfairness of it all. Her expectation of fair treatment had been violated, she had not been treated with the same respect as the other professors, and she had been lied to by her superiors." Well, where I come from "quite the contrary" is not the first thing that comes to mind - more like seething rage. I feel like the authors didn't want to come across with too strong a stance in case the offend someone or, God forbid, come across like socialist reformers. Understandably so, but this spiritless and appeasing approach doesn't work either. The first half is very nice blueprint of the modern working place and organization. The cases presented are short, but spot-on, the explanations are excellent. The author (professional psychologist, not journalists) stresses repeatedly that stress and burnout is not personal problem and must be addressed holistically. I skipped the second half, as it's outright utopian and naive according to my experience. Or I am way too disillusioned. Excellent read for people feeling friction at the workplace a The first half is very nice blueprint of the modern working place and organization. The cases presented are short, but spot-on, the explanations are excellent. Excellent read for people feeling friction at the workplace and losing confidence in their judgment and values. Maslach is the expert all the other experts turn to. If you are suffering from burnout yourself or if you're a manager of employees heading down this awful path, read this book. Maslach's research is extensive, but this book is a quick, practical read. You will get chills as you see yourself in her examples. There aren't many books that completely change my way of seeing the world, but this one did. Must read.